Homeschool supplies are necessary whether you are just getting started with homeschooling or whether you are a veteran homeschooler. Here are some items that will help you make your homeschool year even better. 1. Pencils, Markers, Pens, and any other fun writing instrument you can think of. Crayola makes some interesting utensils. You don't have to spend a lot of your money for homeschool supplies on these. Just keep your eye out for businesses that are giving out free pens and pencils or give your child some fun markers for their birthday, Christmas or back to school. Who doesn't want to use a new writing utensil? 2. All kinds of paper - You can get big paper, small paper, lined paper, colored paper, notebooks, drawing pads, story telling pads, graph paperand any other variety of paper you can think of. There are many sources of free paper that you can find. Then you can buy what you don't find for free to add to your collection of homeschool supplies. 3. Books and resources - When you are homeschooling you usually get a good collection of books whether you use a packaged curriculum or make up your own list of books and resources. Don't feel like you have to go out and buy a library of books your first year. Sometimes it's good to buy enough for just a few months at a time. Free books are available too at the library or borrowed from fellow homeschoolers or friends or you can also take advantage of buying used homeschool books. Remember less is better. If you get too many books, it's easy to get overwhelmed. 4. Crafts and Art Supplies. Any time you can use hands-on resources, your child will probably learn more and remember it better. Let your children paint, draw or create something from nothing. It can be about what you just read about or some area of life that they are interested in. 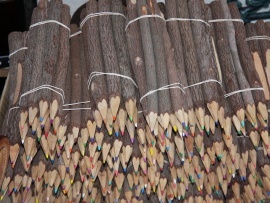 You can find lots of arts and crafts supplies at thrift stores and garage sales. Many craft stores offer great coupons where you can get the homeschool supplies you need for less. 5. Math Manipulatives - Children learn math first by playing with objects. You can purchase a fancy set of math manipulatives or you can use M&Ms, raisins, coins, or anything else you can think of to help your child learn math concepts. Are you just getting started in homeschooling? 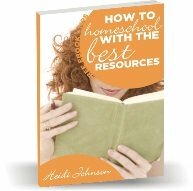 Get the help you need by getting the free ebook "How to Get Started with Homeschooling" and get free tips and help from a veteran homeschool Mom.